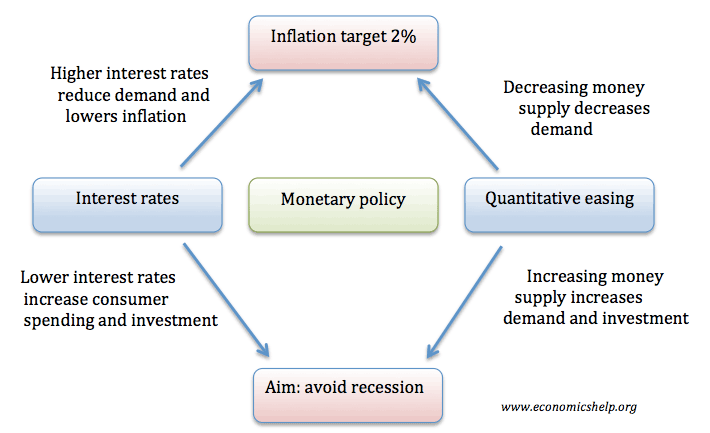 Monetary policy involves influencing and controlling the money supply/interest rates to target inflation and economic growth. Monetary policy primarily involves changing interest rates, though it can include other tools such as quantitative easing and open market operations. Central Banks were often created out of a desire to help the government finance wars. The primary target of monetary policy is low inflation. e.g. The US – The Fed target inflation of 2%. Discount rate. A Central Bank typically sets the discount rate – the rate at which commercial banks borrow from the Central bank. If this discount rate is increased, commercial banks will usually pass this rate increase on to their consumers. In the UK, the Bank of England set the repo rate. In the US, it is called the discount rate. Open market operations. When a Central Bank buys or sells government bonds to manipuate short-term interest rates and the money supply. If the Central Bank creates money and buys government bonds on the open market, this will increase the money supply and reduce interest rates. If the Central Bank sells government bonds, then it takes liquidity from the market and reduces money supply – thereby increasing interest rates. Reserve requirements. The % of funds a bank must hold against liabilities. If the reserve ratio rose from 1% to 2%, the bank would have to keep more cash and reduce lending. Why do interest rates have such a big impact on the economy? Increase mortgage interest payments – leaving households less disposable income and makes buying house less attractive. Cause hot money flows. Higher interest rates in the UK, lead to more demand for saving money in the UK – thereby causing higher demand for sterling, appreciation in sterling and making exports less competitive. 1668 Sveriges Riksbank – Sweden. The world’s first Central Bank. 1694 Bank of England – in response to King William III’s shortage of funds in financing the nine years war with France. The Bank gained the right to print money in return for lending the government money. 1800 Banque de France – Created by Napoleon to help finance his wars. 1998 – European Central Bank (ECB) independent from date of creation. Is the US Federal Reserve independent? The US Federal Reserve is part of the US government but has an operational independence. Its objectives from Congress are maximizing employment, stabilizing prices, and moderating long-term interest rates. Its decisions do not have to be approved by the President, so it has operational independence to set interest rates. However, presidents can appoint sympathetic economists and also put political pressure on the Fed. During the 1950s and the ongoing Korean War, President Truman pressed the Fed chair William McChesney Martin to keep interest rates low – despite the inflationary effects of the war. Martin refused Truman, creating bad blood between the two. Truman is said to have called Martin a traitor for keeping interest rates high. In the 1960s, Lyndon Johnson was more successful in brow beating the Fed to keep interest rates low. Johnson leaked a false story that Martin was getting a 50% pay rise. The resulting bad publicity dissuaded Martin from raising rates. Richard Nixon also tried to put pressure on the Fed to keep interest rates low. In the 1970s, the cost-push inflation of the decade led to the rise of new monetarist policies. With Monetarists like Milton Friedman arguing Central Banks should make control of inflation their primary goal. In 1979, Fed chair Volcler raised interest rates from 11.2% in 1979 to 20% in June 1981. It brought inflation under control, but at the cost of the 1980-82 recession. In the 1990s and 2000s, Fed Chair Alan Greenspan was seen as the ‘maestro’ attaining the dual-mandate of low inflation and economic growth. Presidents sought approval of Greenspan rather than trying to influence him. However, the financial crisis of 2006-09 led to a revaluation of Greenspan’s legacy. Does Central Bank independence help reduce inflation? 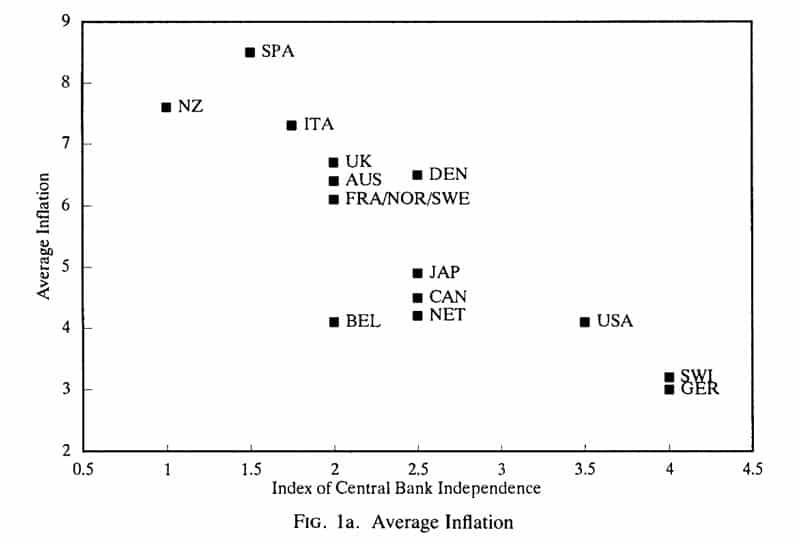 A paper by Alesina, A and Summers, (1993) on Central Bank Independence and comparative inflation performance, suggested there is a link between Central Bank independence and lower inflation. However, Joseph Stiglitz has criticised Central Bank Independence arguing that in the financial crisis, Central Banks felt a greater responsibility to bailing out the finance sector and the banks they were supposed to be regulating than the wider economy. He argues less independent Central Banks did a better job. An important function of a Central Bank was the concept that it should act as ‘lender of last resort’ to maintain liquidity in the banking system. In 1825, a financial crisis left Britain close to financial collapse. In the aftermath, it was decided that a new convention should allow the Bank of England to intervene and lend to banks in distress.